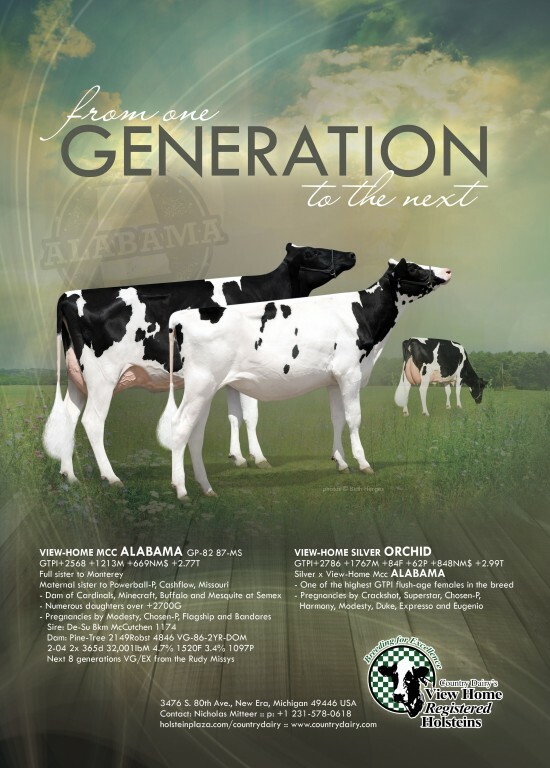 View-Home Mcc Alabama the genomic powerhouse with numerous offspring over +2700G and full sister to Monterey has been pictured and is now scored GP-82 VG-87-MS. Pick your favorite from Cover Girl Alabama! Pick your favorite calf from Hotspots Covergirl Alabama, selling as lot 10G is a buyers choice of three high ranking Alabama daughters! 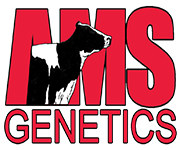 Alabama is following her dams footsteps as tremendous brood cow and already has has numerous high testing offspring including a Silver daughter at +2789G and a bull at +2693G at Semex. Selling is a choice of Silver daughters: Silver Rose (GTPI+2705 NM$+799 +3.11T), LilyofValley (GTPI+2687 NM$+805 +2.89T) and Stargazer Lily (GTPI+2641 NM$+802 +2.00T). They are all ready to flush! View-Home Mcc Alabama is following her dams footsteps and is proving herself as a tremendous transmitter! 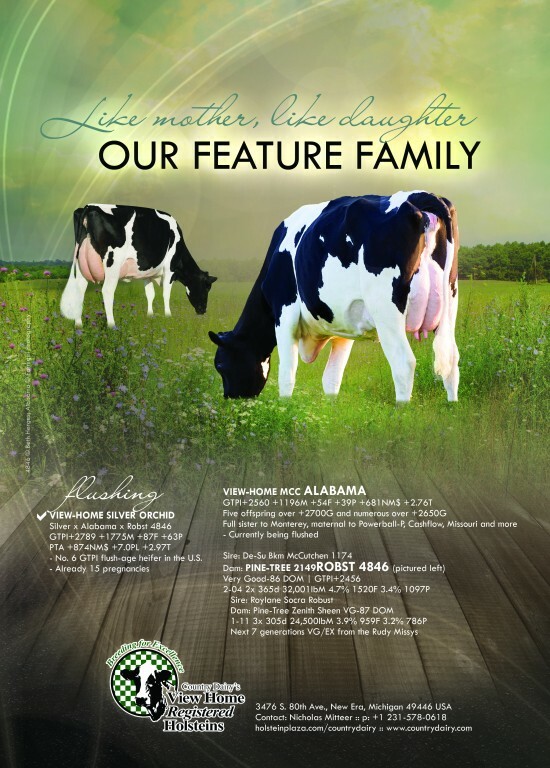 Alabama is the McCutchen daughter of Pine-Tree 2149Robst 4846 VG-86-2YR and the full sister to the popular genomic young sire Monterey @ ABS and maternal sister to bulls like Missouri, Powerball-P and Cashflow! Alabama already has 4 sons over GTPI+2600 and several high ranking daughters up to GTPI+2777! 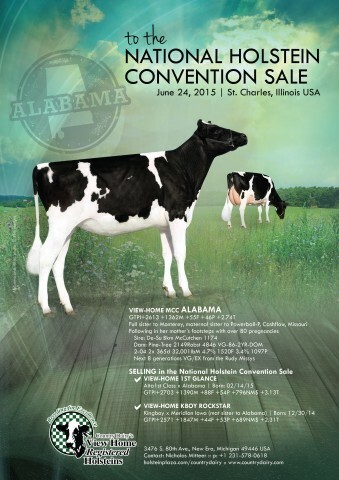 Earlier this summer Alabama her alta1stClass daughter topped the National Convention Sale and in the Holstein Plaza Online Heifer Sale her GTPI+2680 Yoder daughter will be SELLING! View-Home Powerball is increasing his influence in the Polled breed, no less than 16 Powerball daughters are listed in the Top 25 Polled females. Powerball is an Earnhardt son from Pine-Tree 2149Robst 4846 and was bred by Country Dairy. On top of the Polled list is the homozygous Polled Powerball daughter Seagull-Bay Roxy *PP, bred and owned by Seagull Bay Dairy. CLICK HERE for the complete top 25. Please note that this in an unofficial list, please inform us if your animal is missing. 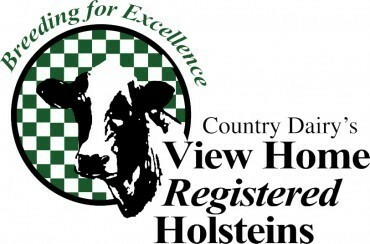 The 2015 National Holstein Convention Sale was held Wednesday evening in St. Charles, Illinois with over 100 head selling for an average of $9800. Topping the sale was Lot 12, View-Home 1st Glance the +2703 GTPI Alta1stClass daughter of View-Home Mcc Alabama the full sister to Monterey and daughter of the tremendous brood cow Pine-Tree 2149Robst 4846. Consigned by Country Dairy, Inc., she was purchased by Peak Genetics for $103,000. 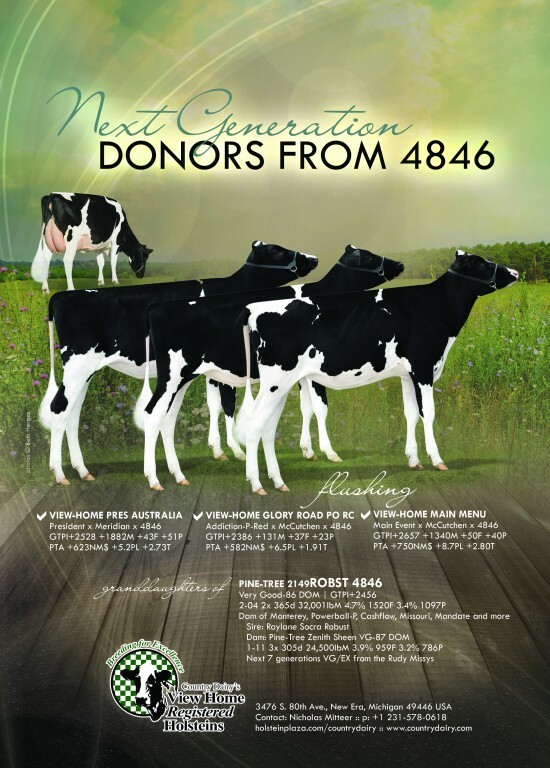 Second high seller at $43,000 was Spruce-Haven Sil So16348, a +2684G Silver daughter and sold to Rock-Hill Dairy. 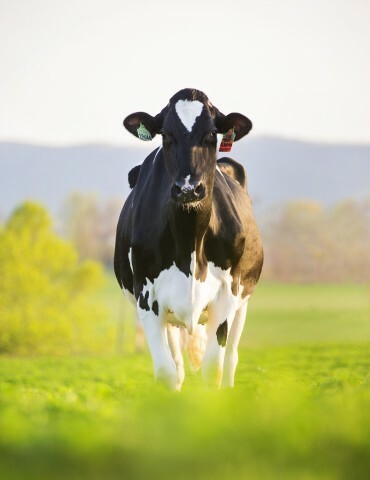 Selling tomorrow evening on the National Holstein Convention Sale from the Pine-Tree 2149Robst 4846 family as Lot 12 i a +2703G Alta1stClass daughter with +1390 lbs milk and over 3 points on type! Her dam is the full sister to Monterey, View-Home MCC Alabama! Also selling from the family is View-Home Kboy Rockstar at +2571G and from the Meridian maternal sister to Alabama. 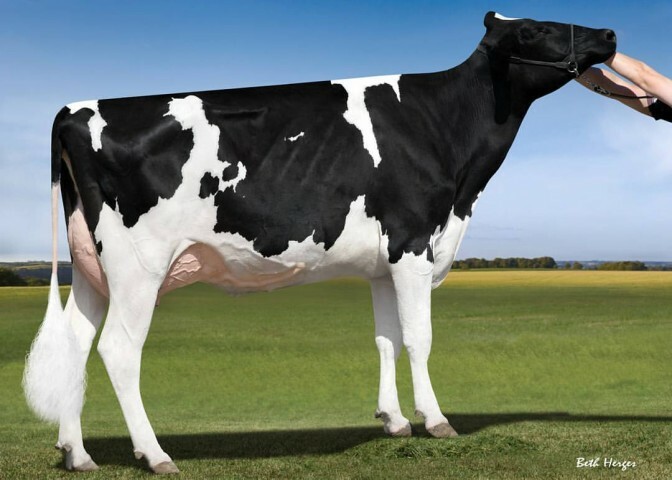 Now online are the Top 25 New Genomic Females for June 2015 and topping the list is a +2789G AltaSpring daughter backed by the Eroys and owned by Peak Genetics. Coming in at No. 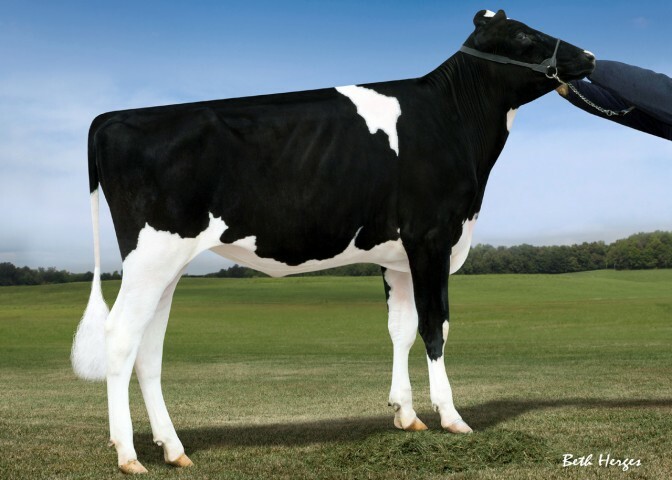 2 is a Lottomax granddaughter +2758G from Robst 4846 owned by Country Dairy. In total seven descendants of the Rudy Missys tested in the Top 25. 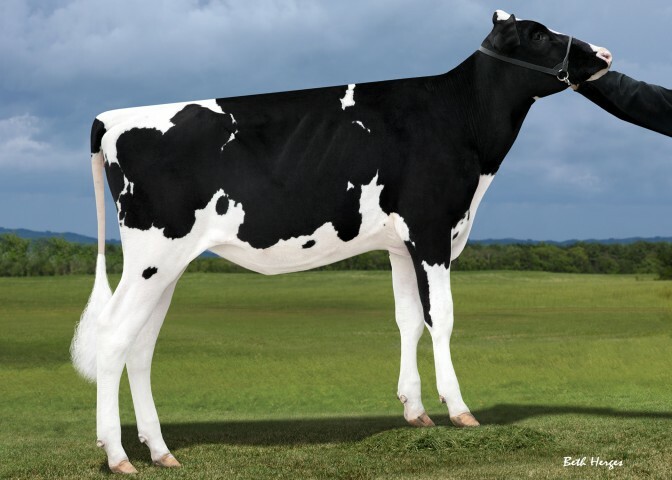 New milking photo of Pine-Tree 2149Robst 4846-ET, the +2396G Robust daughter of Zenith Sheen and scored Very Good-85-2YR with 86-MS. 4846 has several high indexing daughters and sons, including Monterey at ABS Global with GTPI of +2538. Country Dairy had a limited classification on November 29th. Highlight of the classification was Pine-Tree 2149 Robst 4846-ET scores VG-85 at 2-07 with a VG-86-MS, she is the dam of the #1 Polled bull scoring GTPI+2482. Other highlights were 4 new VG-2YR, 7 New VG Cows and 20 cows were raised in score.